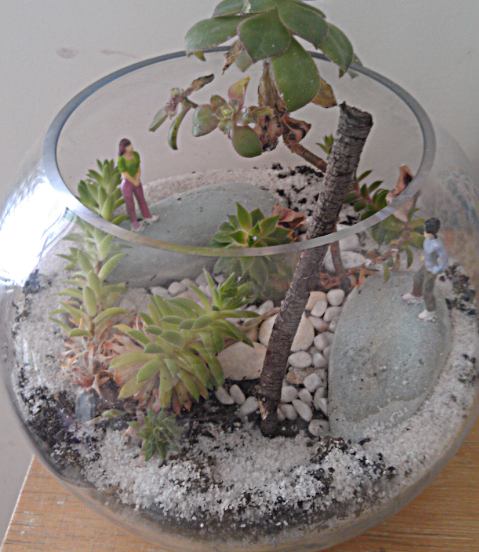 When I was there the other week I noticed this terrarium that had plastic people in it. Mich explained that she’d done a course at Petite Green in Williamstown and the terrarium was the result. She went on to tell me that the scene was inspired by that ‘romantic’ meeting at the Dan O’Connell. If you look closely the girl is wearing green (St Patrick’s Day), the guy has dark hair (like Drew), and Michelle said she tried to make a hill, but it just didn’t work out … she’s such a laugh! 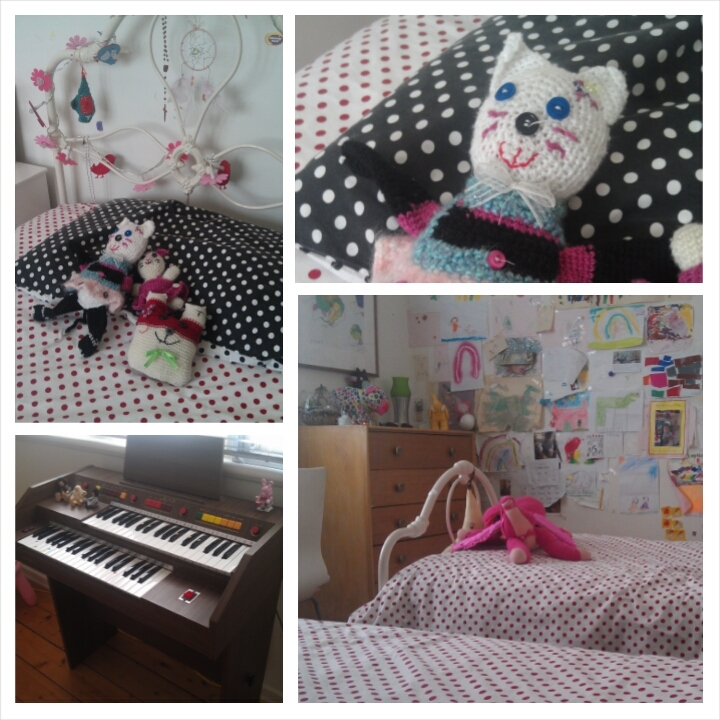 The reason I went over was to take some photos of all the lovely things in their house. They are both creative souls (flowers on the dining table by Drew). Their house has a great mix of old, new and hand made. I’ll start with the terrarium it is in their daughters room. It sits on a chest of drawers Mich acquired when I lived with her, so it’s got some heritage value, and I am sure it was inherited or second hand then (we didn’t have any money). The art work above was done by Mich (she’s very talented). 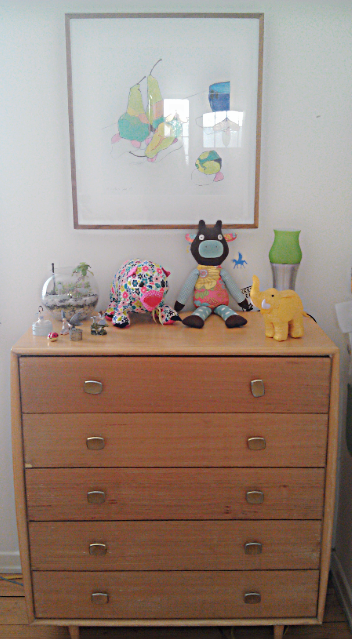 And she noted that she is contemplating an upgrade via a new set of ‘knitted handles’ for these drawers (how fun!). The girls room in general is lovely. A wall of kids art – which is always interesting – second hand matching white iron beds, lots of little decorations, hand made toys and a really great small organ that used to belong to Mich’s uncle. And there’s a play room as well. It has red desk which they bought new (as a bar table with 4 stools) from a shop that was closing down on High Street. And above it are the cutest dolls … made by Mich’s mum, Carmen. 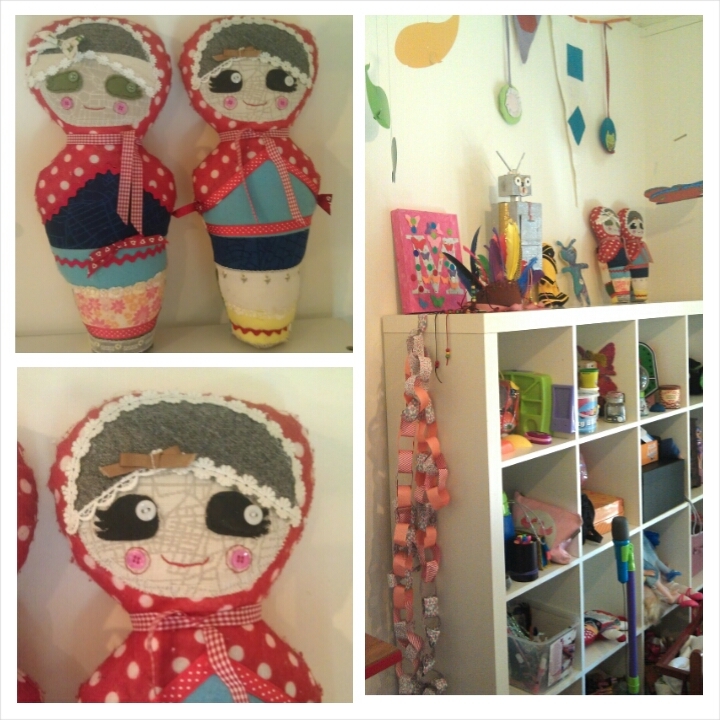 And then there are more dolls, and lots of lovely bits and pieces for kids on the Ikea shelves. Some made by Carmen, a robot made by Fred (Mich’s dad) and also art by the kids. Notice the faces of the red dolls that sit on these shelves? 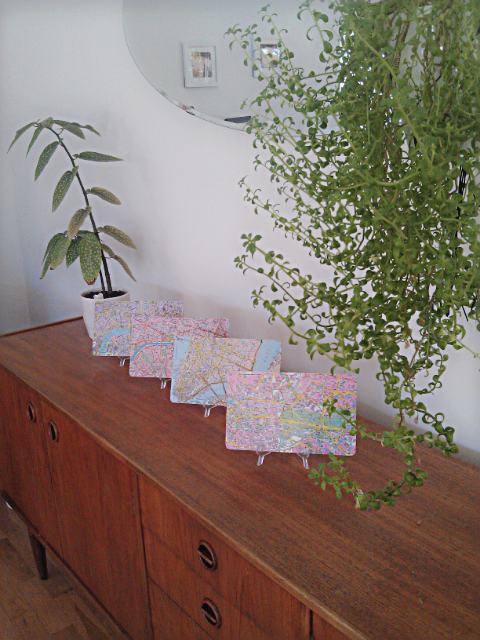 The are made from the scraps of the map material used to recover the second hand arm chairs in the lounge room. 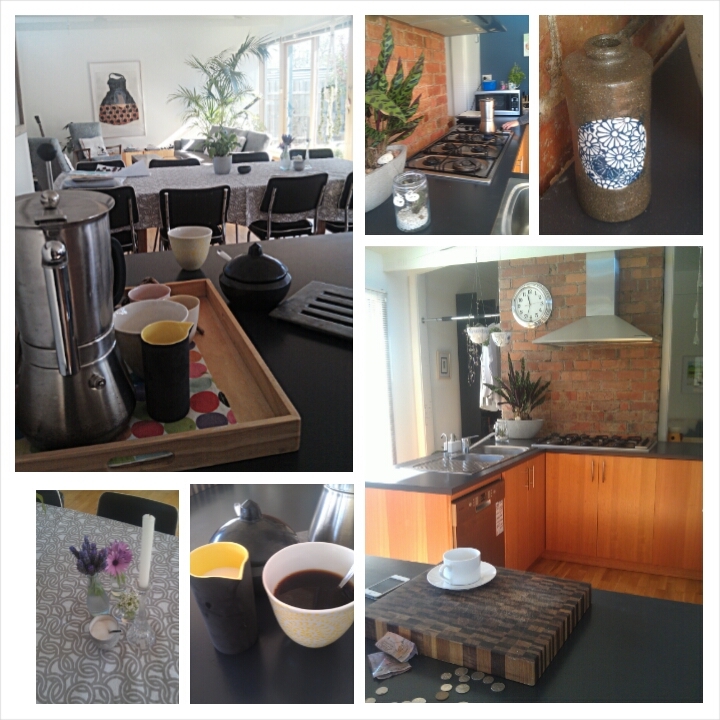 When you start looking lots of things have an urban design theme in this house! The lounge and dining room is an add-on to the original house, and runs the length of the block. It is great to live in as it is flooded with natural light. Drew and Mich are currently turning it into an ‘inside garden’ (yes, it was after visiting them that I got on my macrame roll). The macrame is encroaching .. some of it is new and some of it is second hand. And there is also a set of the most gorgeous ceramic planters hanging above the kitchen bench (they’re new not second hand, but worth a picture!). 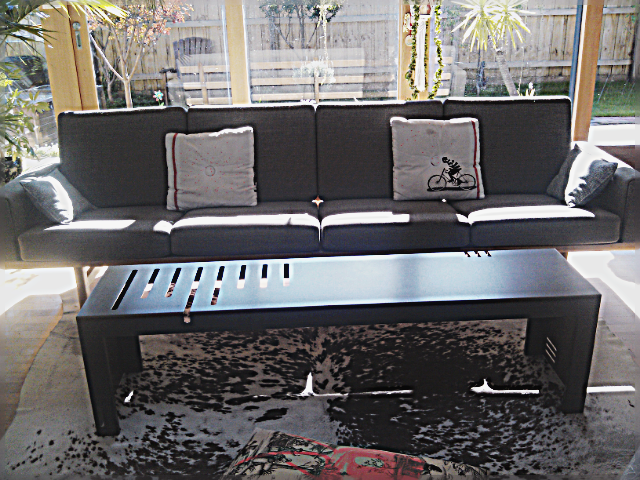 The couch, on the other hand, was purchased from Great Dane and is a restored original. And the cushions are made from tea towels (the are new but repurposed and that counts). Cycling is Drew’s passion, and so bikes feature quite a lot around the house too. Isn’t it lovely? It feels big, but there are lots of little things around to make it personal, and lots of interesting art (check out the dress below – we gave that to them as a wedding present!). It’s a house with great space, light and style. I love it (and them). 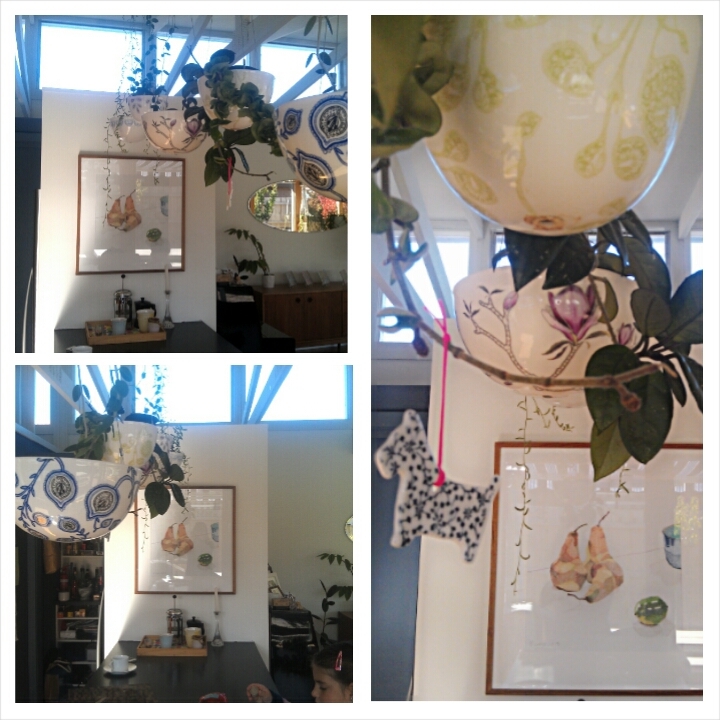 Andrew and the kids bought me two Boskke sky planters for mothers day to add to the hanging plant collection. The plants hang upside down in them. Still trying to work out where these lovelies will live. 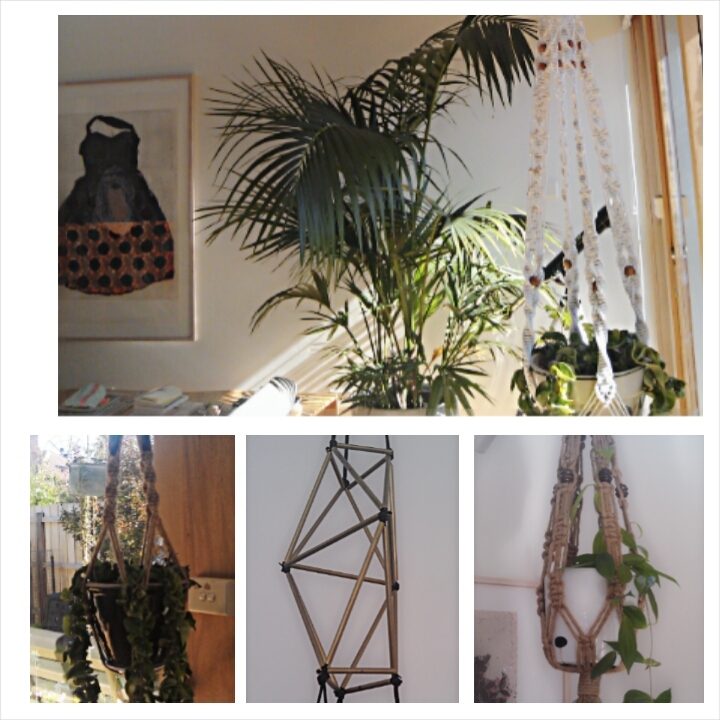 love love love the ceramic hanging planters…..